Shop our vast array of stanhope peephole jewelry. Now you can have your favorite photo with you everywhere you go. Each hand-crafted lens magnifies the microscopic picture over 160 times, which creates a crystal clear view. The tiny lens size of 2-3 millimeters in diameter allows them to be mounted in just about any piece of jewelry or other personal items. They are so small nobody but you will even know it's there! Transform your favorite photo into a stunning keepsake that will be marveled at for generations to come. Each fine quality piece is available in our online store. You'll find pendants, charms, and other jewelry inspired by vintage, classic, modern and contemporary eras. Our store is uniquely designed to allow you to completely customize most of our pieces with your favorite photo right from your computer. Our Stanhope Jewelry Store provides you with a safe and secure environment to browse our products and complete purchases. Check back with us often as we add several new items every month at special introductory prices. Be sure to sign up for our Stanhope Jewelry Club membership to receive valuable discount coupons and special sale announcements. Looking for a Great Gift - See our Lords Prayer Crosses. Choose from beautiful settings, sparkling Swarovski crystal colors, and you choice of 30 different prayers for the stanhope viewer. You can even select to have you one personalized with the photo of your choice. They're wonderful keepsakes for baptism and confirmation photos, births, first communion and many other special moments. Be sure to visit our coupon page for our biggest saving ever! Need help or have a question? 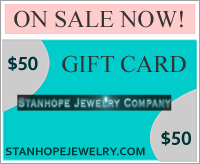 Visit our Customer Service page or contact us for more details at info@stanhopejewelry.com. No matter what it is, Tara and our staff are always happy to aid you in the design, layout, or customization of your keepsake jewelry. We provide you with everything you need...and the possibilities are Endless!